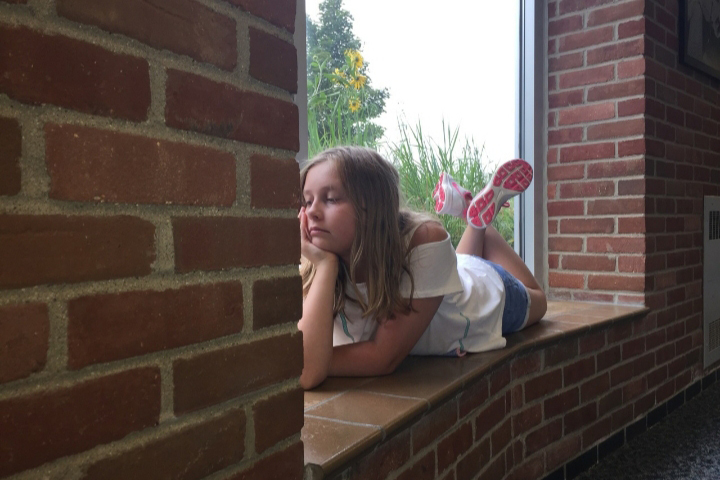 Editor’s note: The following profile was written by 15-year-old Calhoun Christian School student Taylor Groth as part of Kellogg Community College’s Journalism and News Writing Camp, running July 23 through 26 on the College’s North Avenue campus in Battle Creek. Groth also shot the above portrait of her profile subject Ellah Pace during the camp. Ellah Pace wants to be a sign language interpreter but also loves to write. “I could write for hours,” Pace says. Pace is 10 years old and goes to Harper Creek Middle School. She is undecided on what college she wants to attend, but knows she wants to go to a college where she can major in signing. Pace also enjoys reading and coloring. She was born Nov. 14, 2007. She began signing in the fourth grade when she sat next to her friend Randy, who is fully deaf, and signing is her way to talk to people. One of the biggest moments in Pace’s life is when her little brother Giovanni was born. Giovanni is a 6-year-old first grader at Beadle Lake Elementary School. Pace gets her inspiration from her mom, Rendy Pace, who sells insurance at Allstate, who she says supports her in every way. If signing does not work out, Pace says she wants to be an entrepreneur. She is planning to open a cosmetology business and only work on pedicures, manicures and makeup. She wants to open her business because she likes to do nails and makeup. When Pace grows up, she wants to live in Chicago and plans to open her business there. She wants to have a house on the lake and wants to raise a family there and have two kids.